The majority of the visual effects used throughout the iOS 5 user interface on the iPad are performed using Core Animation. Core Animation provides a simple mechanism for implementing basic animation within an iPad application. If you need a user interface element to gently fade in or out of view, slide smoothly across the screen or gracefully resize or rotate before the user’s eyes, these effects can be achieved using Core Animation in just a few lines of code. Affine transformations offer an extremely powerful and flexible mechanism for creating animations and it is just not possible to do justice to these capabilities in a single chapter. In order to learn more about affine transformations, a good starting place is the Transforms chapter of Apple’s Quartz 2D Programming Guide. The remainder of this chapter is dedicated to the creation of an iPad application intended to demonstrate the use of Core Animation. 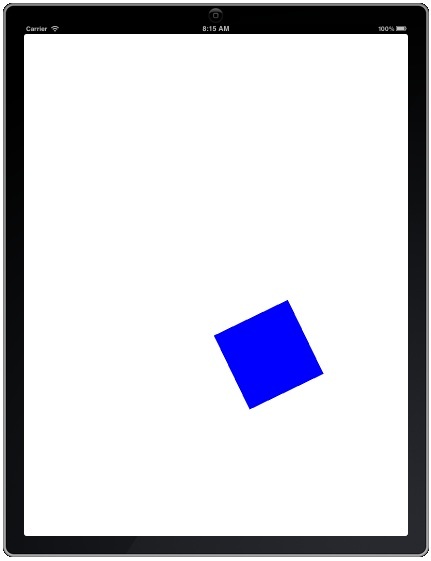 The end result is a simple application on which a blue square appears. When the user touches a location on the screen the box moves to that location. Through the use of affine transformations, the box will rotate 180 degrees as it moves to the new location whilst also changing in size. Once the all the code changes have been made and saved, click on the Run button in the Xcode toolbar. Once the application has compiled it will load into the iOS Simulator (refer to Testing iOS 5 Apps on the iPad – Developer Certificates and Provisioning Profiles for steps on how to run the application on an iPad device). Core Animation provides an easy to implement interface to animation within iOS 5 iPad applications. From the simplest of tasks such as gracefully fading out a user interface element to basic animation and transformations, Core Animation provides a variety of techniques for enhancing user interfaces. This chapter covered the basics of Core Animation before working step-by-step through an example to demonstrate the implementation of motion, rotation and scaling animation.